While the stage is certainly not as big as its Division I counterpart, Division III student athletes quietly dedicate their time and energy to their respective sports with equal vigor. According to the NCAA, more than 190,000 student-athletes at 450 institutions make up Division III, the largest NCAA division both in number of participants and number of schools. Because these students are not likely to sign professional contracts upon graduation, their participation in athletics is driven by passion and love for their sport. And while many colleges and universities require student athletes to sign a code of conduct, when it comes to disciplinary actions, athletes at Division III schools have more to lose. The NCAA publishes a Division III Manual that outlines rules for athletics. Rule 14.5.1.2 (“the Transfer Rule”) states that when a student transfers to any NCAA institution while he or she is disqualified or suspended from the previous institution for disciplinary reasons, the student must complete one calendar year of residence at the certifying institution. In other words, if a student athlete transfers after a disciplinary action resulting in athletic ineligibility, he or she must wait at least 12 months before becoming eligible again. So, transferring after a disciplinary action will not preserve years of eligibility. Most Division III athletes only play four years. It is exceedingly rare to see an athlete take a “red shirt” year, which allows an athlete to preserve an extra year of eligibility, assuming the student’s participation stays beneath a minimum threshold. For instance, in football, an athlete might play in as many as four games and still preserve his right to an extra year of eligibility. 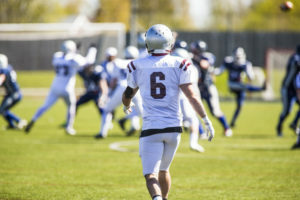 Scholarship athletes in Division I and II can utilize their red shirt years without hesitation, while a Division III athlete who uses a red shirt year will bear the financial burden of paying tuition for that additional year or semester. Sometimes, a student might try to transfer before disciplinary proceedings have concluded, because the social stigma surrounding the investigation has made life on campus unbearable. However, the institution that accepts the athlete must honor the findings and sanctions of the previous school, even if the punishment is levied after the athlete transferred. A student cannot simply transfer to another school to avoid the consequences of his or her missteps on campus. The Transfer Rule was written to ensure that no one “runs from trouble.” However, this rule can force full tuition-paying student athletes to remain at institutions where they are no longer welcome or comfortable. In order not to lose precious playing time, students might be caused to endure hostile learning environments. While the Transfer Rule remains in place, Division III student athletes will be forced to make difficult decisions.